Nice and narrow with a substantial kick in the back, this seat is perfect for a small chop. Fitment: This is a custom motorcycle component that requires basic fabrication skills and mechanical acumen to install properly. If your motorcycle already has a seat hinge and spring bungs installed on the frame, you are halfway there, though some additional modifications may be required. Our Slimline seat looks best on bikes with steep backbones and short rear ends, such as many Japanese and British chops, and many rigid H-D XL's. Construction: Heavy gauge stamped steel pan with high rear kick for added support. Stamped-in ridges on the pan increase stiffness and give the pan a clean, classic look. Matte black electroplated finish. Cover is hand stitched heavy-duty vinyl and is fastened to underside of seat pan with rivets for durability. Foam is molded polyurethane, approximately 1" thick. Installation details: A unique adjustable carriage bolt system on the underside of the seat pan allows you to fine tune the location of the seat hinge and both springs. This is especially helpful if you are installing our Slimline seat on a frame with preexisting spring bungs welded onto the rear cross member. This is not a bolt-on product. Great Seat / Fast Shipping as always from LowBrow.. 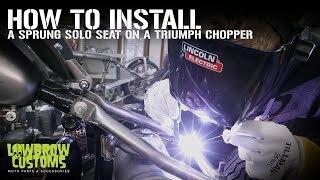 However be careful purchasing this seat if you're under the impression it will fit one of your bikes that already has bungs welded for a previous Biltwell solo seat. I previously had a ThinLine seat and wanted to changed the look with this Slime Line... needless to say because of the rise on the back of the seat it makes the springs go out at an angle that my welded bungs do not agree with. I believe I will be unable to return the seat because I have marked up/scuffed up the bottom seat pan during installation. So unlucky day for me hopefully this review saves someone money and time , also prevent someone in making the same mistake. This seat and and the Builtwell mounting hinge are excellent quality. With all the work of building a bike the look is very important, and they do look great. Great Quality Seat. Flawless construction. Wasn't surprised to receive this and see the same great quality as the other biltwell parts I've ordered. You might want to go with the larger solo seat though if you're wide bottomed.